Anduril: the Revolucio tact is not even listed on the wiki, so I assumed it didn't exist at all. 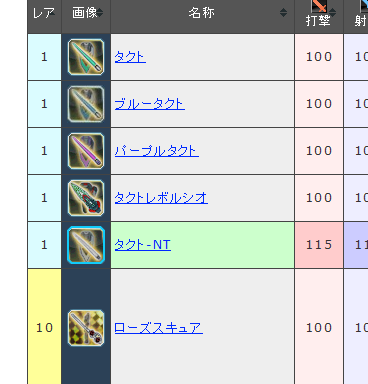 It is listed, but because it is a 1*, it is between Purple Takt and Takt-NT. If by "wiki" you mean "SWiki", yes, it is listed on the wiki. Don't forget that it is a 1*, so it appears near the top of the list (it is fourth in the list, in fact). For some reason, the Google translaotion of SWiki names it "Tact Time". And I know it exists because I have one. I probably should throw it out, but I know I never will. I was about to mention it. I was looking for Revolucio Tact, not Tact Revolucio. Also you did mention it but I didn't register that it was a one star, I was looking in the 13 stars list. Still sounds like this policy is to prevent casuals from crying and leaving. Casuals do not care if they do well or not. Tell a casual he's doing bad, the most likely answers are: "I don't care", "I can't improve any more, that's my skill ceiling" or "How can I improve myself?". The ones crying are always pseudoelitists, ie. players who think they are good but aren't, but still want to "advertise" how better they are to others. Perhaps, but just for giggles, can name some players that got banned for this? No, but I also cannot name anyone who got banned for using a damage parser. How could this tool disrupt gameplay? Does it cause lag or something? No, by "disruption" I mean causing unrest and antagonizing others over performance on something that is supposed to be a game. Just like having your character use "/a /ci 1 /toge AAAAAAAAAAAAAAAAAAAAAAAAAAAAAAAAAAAA!" as a PA/Tech autoword is disruptive, despite being "legal" according to the available game options. I know I have been told twice in the past to cut down on my autoword usage because it's annoying, and both times it was on EQs where events were back to back. So has anyone been using Miss Misty's OverParse 3.1.0? I know its not safe since it violates PSO2 TOS but has anyone been reported that they got banned in using it? I've tried to use it, but is glitchy: it can randomly crash at any moment, usually at the end of a battle and especially with newer content (The Chocolate Way 2019, the last Limited Quest, etc.). I prefer the one from TyroneSama. Seem it's not a problem coming from Orbit as I can use my Orbit Dual blades on Jupiter Tulus for example. Edit: Did additional test with Radius Arca and Lumiere BB. Only Radius is showing up. Last edited by Masu; Jan 25, 2019 at 04:09 PM. And you're sure that the Orbit BB is at +10, right?